It’s the lesson that so many of us learn the hard way: Buying a cheap sofa is one of the most expensive home furnishing mistakes we can make. A cheap sofa will quickly sag and lose its shape. A durable sofa, however, retains its quality for years, saving you money (and more couch shopping) during the years ahead. A couch should last between 7 and 15 years, so shopping for one can feel daunting. It’s not only about finding the piece that’s perfect for now, but finding one that you’ll continue to love—and find comfortable—for more than a decade to come. You have many options between natural fabrics and synthetics that offer durability, but you may have a harder time than you think distinguishing the two. Durable synthetics—like solution-dyed acrylics and blended polyester—can be made to look and feel like natural fabrics. Even outdoor fabrics are making their way indoors, offering high durability and stain resistance in fabrics that look and feel surprisingly natural. To see just how many fabric options you have, look at our Wellington series of living room furniture. Each piece comes in a wide variety of upholstery and leather. For even more options, our Custom Upholstery pieces allow you to customize nearly every aspect of your sofa. Learn more in our Fabic Workroom. A note to pet-owners: If your pets have charmed their way to a spot on the sofa, you’ll need to be extra careful in your fabric selection. Consider ultrasuade: It’s soft and easy to clean (and, for some reason, most cats aren’t interested in scratching it). Although it seems counterintuitive, leather is a good choice for pet owners as well. Leather’s durable, resists odor and pet hair, and it’s easy to clean. Learn more in our Leather Workroom. A sturdy frame is the foundation of a durable sofa. The most durable frames are made from thick, laminated hardwoods. Look for a couch with an interlocking frame, which has fewer joints and fewer (but larger) pieces of wood; this minimizes the stress points in your couch. See information on our quality upholstery here. Springs are crucial, but like the frame, they’re invisible to shoppers. How, then, can you tell if a couch has heavy metal springs? Test them for yourself. Sit on a couch, and get a feel for the springs within it. Do they feel firm and tightly spaced together? Or do they feel weak and offer too much give? Beware: Weak springs with too much distance between them are a sign that the couch will weaken quickly with wear. But remember, heavy springs should mean a quality couch, not an uncomfortable one. 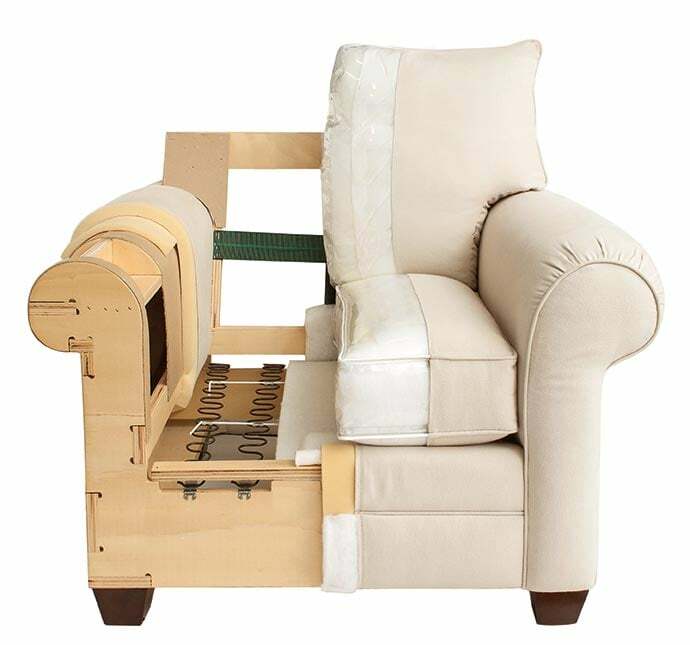 Even the most comfy, sink-in-your-seat couch can have a sturdy frame and heavy springs. Case in point is our Envelop series, which offers pieces that form customizable sofas in whatever configuration you need. You may be tempted to go for the cheaper polyurethane foam, but go for the HR filling instead. You’ll find that it makes your couch more durable and comfortable, retaining its shape long after other couches begin to sag. Even a durable couch requires care to maintain its quality and extend its life. For upholstery couches, vacuum the fabric each month to prevent food, dust, and other debris from becoming enmeshed in the fabric. For leather sofas, clean spills as they occur and use a conditioner on them every six months (but, please, avoid normal cleaning supplies like soaps and detergents). Learn more about caring for upholstery on our quality page. Find your perfect couch. 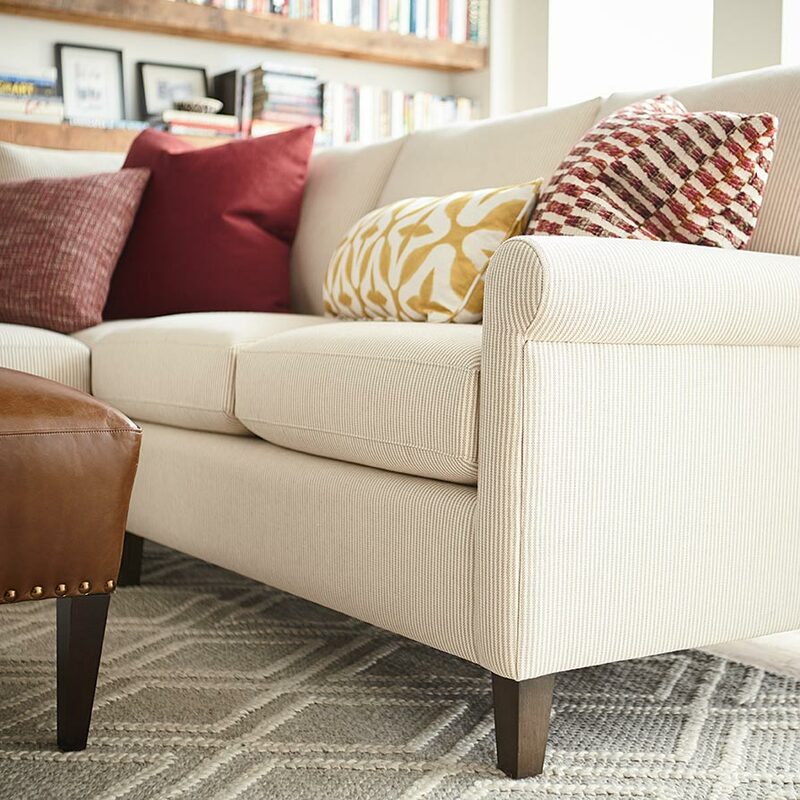 Shop Fabric Sofas and Leather Sofas at Bassett, which has a century-long tradition of furniture craftsmanship, offering quality pieces that last for years to come.